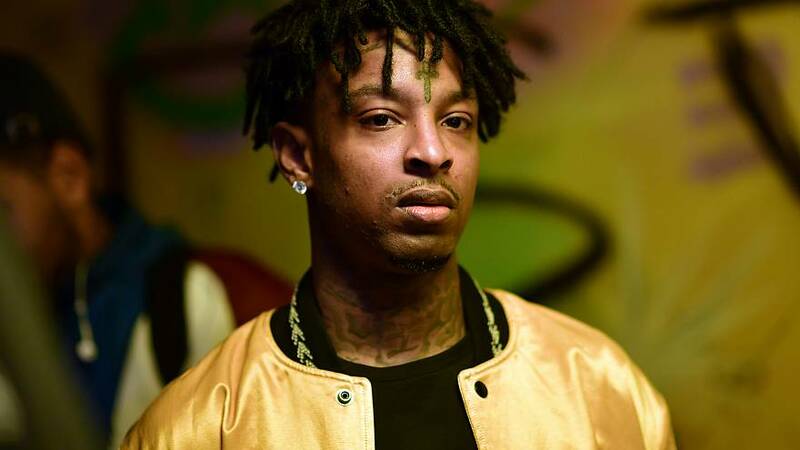 Immigration authorities were trying to "unnecessarily punish" and "intimidate" 21 Savage into giving up his fight to remain in the United States, his lawyer said Monday, as the rapper faces deportation and potentially a 10-year ban from the country. The musician, whose real name is She'yaa Bin Abraham-Joseph, "never hid his immigration status" from the U.S. government and has a pending U-Visa as the victim of a crime, his attorney, Charles Kuck said in statement Monday afternoon. Abraham-Joseph also has U.S. citizen that he supports, which could make him eligible to stay as well, Kuck said. Abraham-Joseph, 26, was taken into custodySunday in the Atlanta-area for allegedly being in the country illegally, Immigration and Customs Enforcement (ICE) said in a statement. ICE spokesman Bryan Cox said that Abraham-Joseph was also convicted on felony drug charges in Oct. 2014. ICE said Abraham-Joseph was an "unlawfully present United Kingdom national" who was brought to the U.S. as a child legally in 2005 on a visa that expired a year later in July 2006. Kuck acknowledged Abraham-Joseph and his family did overstay their visas. "As a minor, his family overstayed their work visas, and he, like almost two million other children, was left without legal status through no fault of his own," Kuck said Monday. "Mr. Abraham-Joseph has never hid his immigration status from the U.S. government," he added. "The Department of Homeland Security has known his address and his history since his filing for the U-Visa in 2017, yet they took no action against him until this past weekend." The rapper was in ICE custody in Georgia and placed in removal proceedings before immigration courts, ICE said Sunday. Kuck said Abraham-Joseph was detained based on "incorrect information about prior criminal charges" but did not specify what about the charges he was disputing. The lawyer added ICE was refusing to release Abraham-Joseph on bond. The lawyer added that Abraham-Joseph was neither a flight risk nor a danger to the community, adding, "in fact, his contributions to local communities and schools that he grew up in are examples of the type of immigrant we want in America." "We and he will fight for his release, for his family, and his right to remain in our country," he said. ICE did not respond to immediate requests for comment Monday. A U-visa is a special visa for victims of certain crimes "who have suffered mental or physical abuse and are helpful to law enforcement or government officials in the investigation or prosecution of criminal activity," according to U.S. Citizenship and Immigration Services. Only 10,000 U-Visas are available each year. Kuck's statement did not specify the incident under which Abraham-Joseph applied for the visa. Anastasia Tonello, president of the American Immigration Lawyers Association, said Abraham-Joseph could be facing "a pretty difficult case" if what ICE alleges is true. "He's in one of the most notorious jurisdictions for removal," she said. "Atlanta has a very high rate of denials on any type of discretion or relief." Tonello said the U-Visa application could help Abraham-Joseph's case if he receives deferred status while that case is pending. If deported, Abraham-Joseph potentially faces a ban from the U.S. of at least 10 years on the allegations that he overstayed his visa alone, and would need a waiver to come back to the country even as a visitor, she said. Tonello said based upon when Abraham-Joseph's visa is said to have expired, he could have qualified for deportation relief under the Deferred Action for Childhood Arrivals (DACA) program in 2012 if he graduated high school, received his general education development (GED) certificate or was honorably discharged from the U.S. armed forces. Individuals do not qualify for DACA if they have been convicted of a felony, significant misdemeanors or a series of misdemeanors. Because the rapper reportedly dropped out of high school and was convicted on drug charges in 2014, he would not have currently qualified for relief from DACA, which allows children of illegal immigrants to remain in the United States if they were under 16 when their parents brought them to the country and if they arrived by 2007, she said. The Trump administration moved to end the program in late 2017, but federal courts in San Francisco, New York, and Washington blocked that attempt. In January, the U.S. Supreme Court took no action on the program's future, a move that required the government to keep the program going for at least 10 more months.